Flying with Dementia: The Need for Dementia Friendly Airports. Current: Flying with dementia: Why We Need Dementia Friendly Airports. Flying with dementia: Why We Need Dementia Friendly Airports. When we first wrote this blog in 2016, it had just been announced that London Heathrow was set to become the World’s first Dementia Friendly Airport. That meant all 76,000 staff would be trained to help passengers with what is referred to as a Hidden Disability, mainly dementia, and inspired us to write this blog. The term dementia refers to symptoms experienced as a result of disease to the brain. It can present itself in several ways, the most common being memory loss, and difficulties with communicating and problem solving. The effects of dementia can range from the person becoming frustrated and confused by seemingly normal day to day activities, to having to rely on a loved one or carer to look after them when they can no longer do said activities, or even remember who they are. It’s also worth mentioning that there are several forms of dementia that affect the brain in different ways; Alzheimer’s, dementia with Lewy Bodies and both Vascular and Frontal-temporal dementia are the four of the most common. 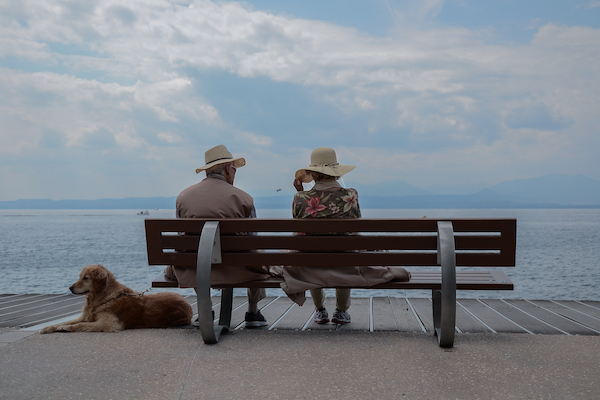 The news from Heathrow got us thinking about the current experience had by those flying with dementia; both those with the condition themselves and their travel companions. 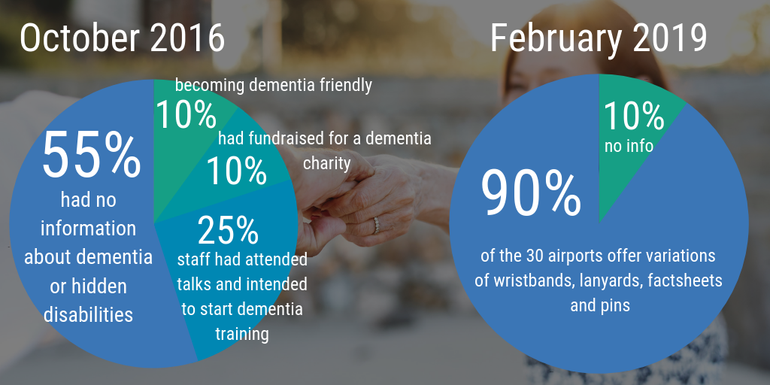 We set out to see what UK airports currently have in place and with the help of several dementia related charities and services, we surveyed the public on their thoughts, experience and knowledge of flying with dementia. How brilliant is this! From 55% of the airports having no information on Dementia or Hidden Disabilities at all on their site, to 90% of the airports offering a form of support for those with dementia in just 3 years. It’s really encouraging to see the stats shift so much; including the extra 45% of airports that have added dementia services to their remit. Bravo! What does my airport offer for passengers with dementia? With that in mind, let’s see exactly what is on offer at the UKs leading airports. If you click the  for each airport, you’ll be taken to full information on their website. Durham Tees Valley Airport No details specific to passengers with Dementia found at this time. What do airports have in place for people travelling with dementia? Aside from Heathrow‘s training programme, inspired by Dementia Awareness week in May 2016, Gatwick followed suit and brought in their lanyard scheme for those travelling with hidden disabilities. These are voluntarily worn by those who feel they may need extra assistance or to simply alert staff that they may need a little extra time or patience shown at security or passport control. Next up, Luton announced that as part of their 2016 commitments, they would have at least 40% of the airport staff undergo Dementia Friends training by the end of the year… By 2019, we can now see that they are working to become a Dementia Friendly airport and also have a lanyard scheme. Manchester, Glasgow, Belfast City and Bristol had all stated in 2016 that either representatives from the airport or small selections of staff had attended Dementia Friends talks or focus groups with charities to establish what they need to implement to better their services. Today, they’ve all implemented a lanyard scheme, with Glasgow becoming the first UK airport to host a virtual dementia tour to help staff and other passengers understand the struggles. In early 2016, the staff at World Duty Free in Stansted hosted an “Orange Day” in conjunction with Alzheimer’s Research UK. The project aimed to raise at least £150,000 to fund the Dementia Research Infoline. In September 2018, they successfully trained their 100th Dementia Friend and they operate a Sunflower lanyard scheme for those with hidden disabilities. Meanwhile, Aberdeen awarded part of its 2015 Airport Community Fund to Alzheimer Scotland, putting them as early runners for a dementia concious airport, and today, they offer a lanyard and card to those that require them. How are the Dementia support organisations working with airports? Many of the survey responses mentioned the need for Dementia Friends at airports so we asked Roshni Jaura from Vida to explain who Dementia Friends are and why they would be a beneficial service for airports to offer. Dementia Friends was set up by the Alzheimer’s Society in the UK with the aim of increasing the general public’s awareness and understanding of Dementia and what it entails. What sets Dementia Friends apart from other organisations is that their main goal is clear and simple—they strive to educate the public about Dementia in order to make society more understanding and caring towards those suffering from the condition—thus allowing them to be highly effective. In order to have the greatest impact and the widest reach, Dementia Friends is open to anyone of any age, even if they have no previous knowledge or experience of Dementia. Since the Dementia Friends initiative was launched in March 2013, two avenues of training have developed—the first is face-to-face training and the second is online training. The face-to-face session is run by a Dementia Friend Champion volunteer—who is trained and supported by the Alzheimer’s Society. Each session lasts one hour and consists of lessons on Dementia and the ways in which you can help those with Dementia, from spreading awareness about the condition to visiting someone who has Dementia. The online video is an interesting training opportunity as well. The video introduces you to Gina, who is living with Dementia, and essentially depicts the challenges that an individual with Dementia is faced with on a daily basis. Both training sessions aim to instill the idea that we must take the time to help and understand individuals with Dementia. 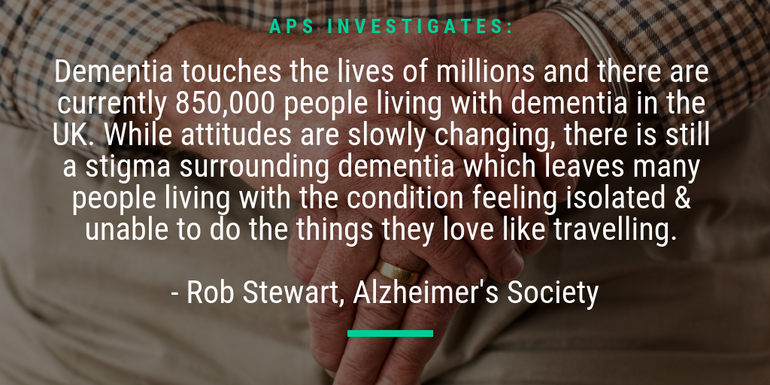 Travelling can be a hectic experience for anyone, let alone an individual with Dementia. Having Dementia Friends at airports would alleviate some of the stress associated with traveling for individuals with Dementia. Individuals with Dementia could take comfort in knowing that Dementia Friends were amongst the crowds of hurried travelers and there to assist them with anything that they may need. Having Dementia Friends in airports would be a great start to improving Dementia patients travel experiences. We at Vida can proudly say that we are Dementia Friends! Alzheimer’s Society is actively trying to break down the barriers that prevent people with dementia living life to the full and tackle social stigma with two important initiatives. Dementia Friends is the biggest ever social action movement to change perceptions of dementia and is transforming the way the nation thinks, talks and acts about the condition. There are now 1.7 million Dementia Friends nationwide who have a better understanding of dementia and the small ways that they can help. Alzheimer’s Society is also building Dementia Friendly Communities to ensure people with dementia feel more able to take part in community life. There are now 208 such communities in England and Wales with pubs, hairdressers, transport schemes, art galleries and supermarkets all set up to welcome people living with dementia. Both initiatives will help people with dementia in all areas of life and that includes travelling from a local airport for a trip abroad. We know there are lots of benefits to a holiday, such as having new experiences and giving the person with dementia and those close to them a break from routine. Flying off on holiday from your local airport should be a relaxing and enjoyable experience for everyone but air travel can be daunting or frightening for many people affected by dementia because people with dementia might find a new environment like an airport confusing, or may become worried if something doesn’t go as planned. That does not have to be the case because life does not have to end when dementia begins. That’s why we are working with airports across the country, so people with dementia can continue to do the things they enjoy after a diagnosis. Alzheimer’s Society is working with a number of airports including Heathrow, Gatwick, Manchester and Birmingham, Bristol and Southend help them become dementia friendly. For people with dementia and their carers, going on holiday should start and end in a safe and stress-free environment. Heathrow showed its commitment to become the world’s first truly global dementia friendly airport when Alzheimer’s Society supporter Carey Mulligan led a Dementia Friends session for staff around the airport. The airport is now developing a customer journey which includes improvements to the handover process. Gatwick Airport has launched a lanyard for passengers with hidden disabilities to act as a discreet sign for staff that they may need support when travelling through the airport. 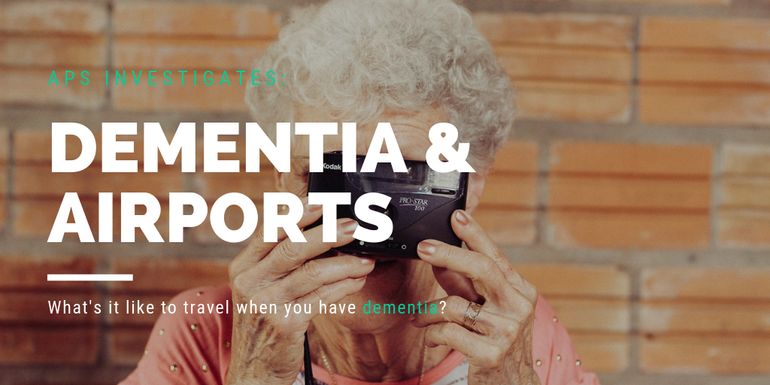 Can you travel with dementia? Of course you can, however, you don’t need us to tell you that taking holidays in the earlier stages of dementia is easiest as severe cases may cause more hurt and frustration for all parties involved. 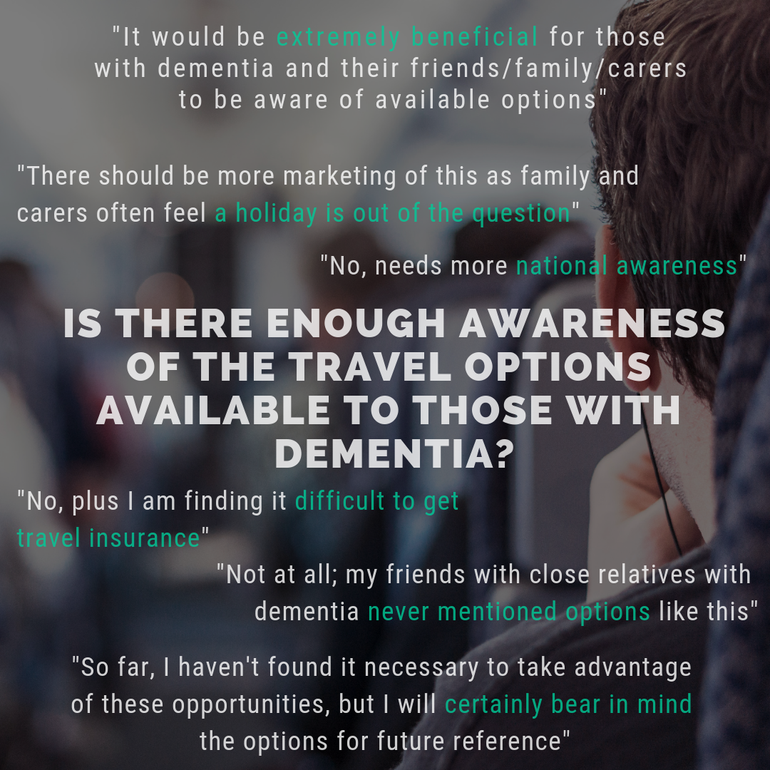 We initially thought that the travel market for people with dementia and their companions was almost non-existent and as we expected, 93% of those we surveyed knew nothing about travel options available to those with dementia and unsurprisingly, 97% of respondents felt that those with dementia are too put off by possible complications to want to travel abroad. However, we were pleasantly surprised after a little research showed us exactly what’s out there. Across the UK, you’ll find several travel options available to you. Companies such as Mind for You, Amy’s Care and Revitalise offer supported holiday schemes in which you can choose to have time apart from your loved one, while their trained professionals take over the care for a while. If you’re still able to be a little active, Dementia Adventure run a selection of group breaks around the UK, including boat trips and coastal treks. If you’re looking at heading overseas, DisabledHolidays.com, Disability Holidays Guide and Can Be Done all specialise in disabled travel across the world and can help you arrange your dream break, whilst Cinnamon Grove run by Cinnamon Care Services specialise in dementia care and has become Sri Lanka’s first European standard assisted living facility . Should you travel with dementia? We gave our respondents the opportunity to tell us about their personal experiences in airports and onboard flights. Generally, airport experiences were far less positive then those in flight. Here are the results of the 2016 survey; we’d love to see how these differ in 2019! It was also noted that flying was deemed too stressful for both the person with dementia and the people caring for them. 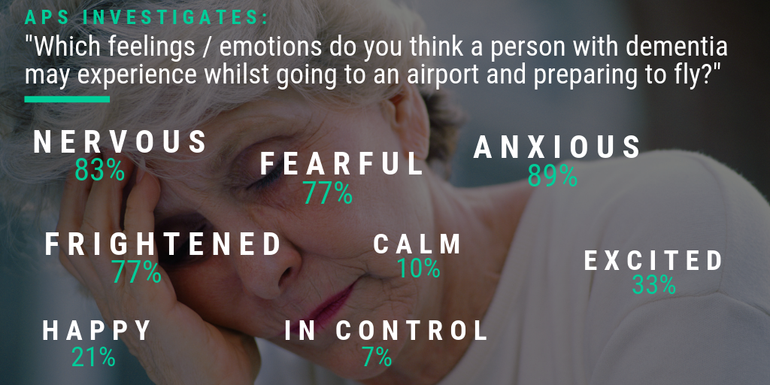 When asked if they thought there was a lot of frustration surrounding airports and the apparent lack of concern and knowledge of dementia, our respondents strongly felt that this was the case. “People do not appreciate why someone may be acting in a way that they do not consider appropriate. There are very strict procedures which can be quite hard to understand” and “Not just airports but the method of getting to them at each end“. Respondents who had dementia themselves told us that they feel they should be entitled to fast track at security as the queuing can cause more stress and confusion, as do the bright lights and music within terminals. Comments from carers included pointing out the rudeness, aggressive behaviour and apparent lack of consideration shown by airport staff, especially at security or when using e-passport gates. In these cases, this lead to the embarrassment and confusion of the person they are caring for, making them upset or panicky. We gathered a lot of extremely useful information from our respondents; be it on experiences, insight into the level of awareness within the community and most importantly, suggestions on how processes could be improved. We feel that the concerns, thoughts and feelings are all extremely valuable and makes it clear that the steps that Heathrow and Gatwick are taking are in the right direction. With that in mind, we’ll leave you with a collection of helpful tips which were collected via our survey, through our insights into open UK based chat forums and with the help of Maria and Nicole and their survey results conducted on behalf of The Australian Journal of DementiaCare, all of which you may find useful, and hopefully, encouraging. We would like to thank all of those that helped us with our research into this article, especially those who took our survey and the organisations who offered their expertise and insider knowledge. 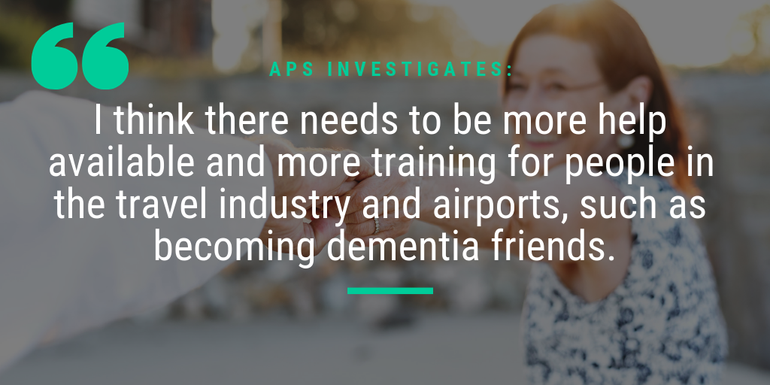 We are passionate about bringing issues with travelling such as this to light and are excited to be in talks with Ian Sherriff, Academic Lead for dementia at Plymouth University, and chair to the PM’s air transport group, about his involvement in helping airports and airlines become dementia friendly. We are keen to see if our article can compliment his continued efforts when he visits the house of commons for his quarterly meeting later this year – watch this space! On a final note, if you are interested to know, below, you will find a summary of our survey findings. My husband finds Security the most stressful. It would be helpful if there was a dedicated Security for those with dementia and other disabilities in a quieter area ( maybe to the side of the main area). I found this article very helpful as we are travelling from Edinburgh to Australia with a stop and extra security checks at Doha and my husband is very anxious. Thank goodness airports are starting to acknowledge the problems at airports for the people affected by dementia. Even those with the very first stages of dementia need help and assistance. Glad airports have begun this journey. Just wish Gatwick had advertised their lanyard scheme so my husband could have used it when flying to Canada in September. Everytime Imasked for assistance was offered a wheelchair. Just needed a quiet place to wait (paid for no 1 lounge) and someone to guide us to our gate to alleviate my husband’s anxieties that I didn’t know where I was going. Also on return trying to guide him through scanning his passport was a nightmare. Just discovered this page. Wish I had known the information. I have given up flying with my husband now. Security was the biggest nightmare even when I told the staff at Heathrow terminal 2 at Xmas 2016. Also at Gatwick and Belfast in 2016. I do hope people begin to understand the problem carers also have, such as what do you do with the cared for when you use the toilet facilities apart from both of you in the disabled loo in the airport. Hi Pat, sorry to hear this! Great point about the use of toilet situation, hopefully it’s something that has been picked up on during the improvements the airports are making to care services! God bless you guys for this amazing work !! !